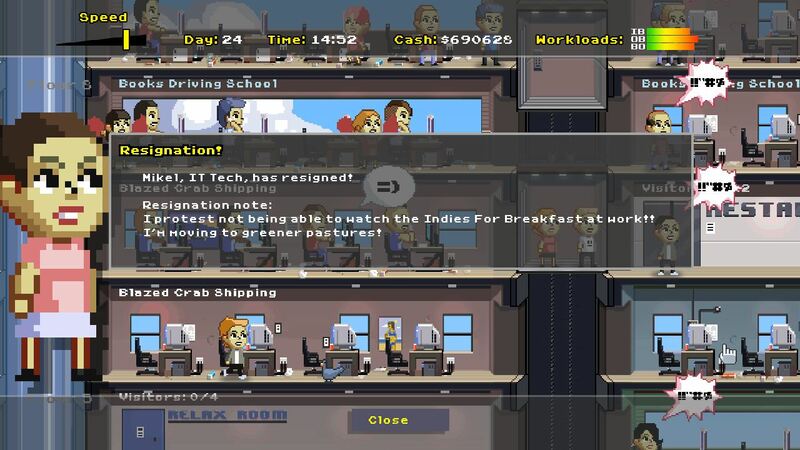 Create and build your own Call Center in Smooth Operators. Develop client relationships while balancing your financials and workload. Plan an efficient operation through micro management of your workforce while achieving objectives. Can you create a successful operation? Running a real call center is supposedly incredibly stressful and not much fun, yet somehow this video game adaption actually manages to make it incredibly entertaining; ain’t entirely stress-free though. You’ll be in charge of salaries, working hours, who to put to work where, and much more. Whether or not you want to send someone on a paid vacation or risk having him/her give up and quit is also up to you, along with where to place buildings like the cafeteria and elevators. Just be careful not to piss off Human Resources! So riddle me this, dear reader: why is Smooth Operators still struggling to get through Greenlight? It’s been out for a while (since January 2013), so lack of availability is certainly not the reason. If you haven’t done so already, might I recommend visiting its Greenlight page and handing over a ‘yes’, if you like what you see? Remember: your vote matters! Smooth Operators is available for Windows from Desura, priced at $2.99 / €1.99 and without any DRM.